For this recipe I aimed for a comforting and filling dish that would fit well with the cold weather most of us are experiencing right now. 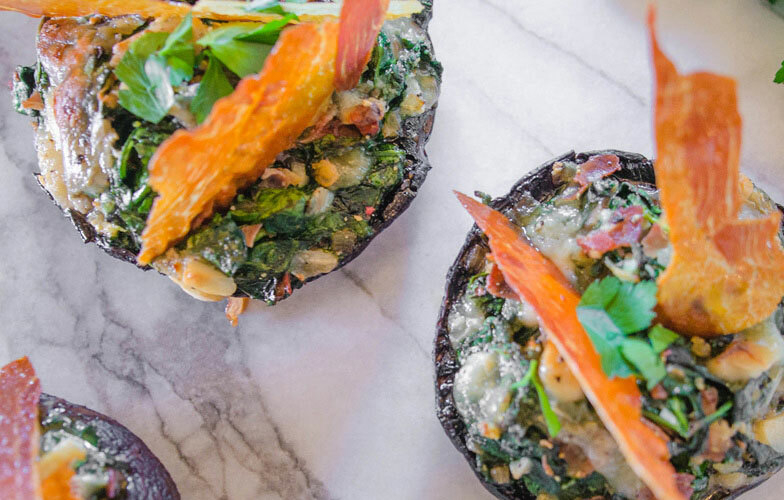 Portobello mushrooms are the perfect vehicle for a warm and savory filling accented by a bright cheese and a fun technique using prosciutto for a decorative flair. This dish can easily be made vegetarian by substituting the crispy prosciutto for thinly sliced baguette crostinis. I hope you enjoy this recipe as much as my family did over the holidays! Preheat oven to 375 degrees. Take 2 cookie sheet sized pieces of tin foil and oil both thinly and evenly. Lay the prosciutto flat on one sheet, and place the other sheet on top. Lay the sheets flat on a cookie pan, and use a weight (preferably another cookie pan) to hold the prosciutto flat. Place in the oven with a timer set for 30 minutes. Remove any stems from the mushrooms and work with a pairing knife to hollow out a suitable cavity for the stuffing. Heat a large skillet or stockpot to medium high heat and add 1/2 T of olive oil. Add the chopped prosciutto and saute until it begins to crisp, remove and strain on a paper towel. Add the remaining 2 1/2 T of olive oil and saute the onions for 1 minute until just softened. Add the spinach and garlic and prosciutto and saute until the spinach wilts and is releases moisture. Remove the spinach from the heat and stir in the cubed cheese. Add the stuffing to the mushroom caps. Place the mushroom caps in the oven for 20 minutes. When mushroom caps are done, garnish with standing pieces of the crispy prosciutto.